Materials were delivered by the USLHS tender "AMARANTH" in September, 1895, and the cook house and quarters for the workers were erected. The old house was torn down, and all the material that could be reused in the new structure were cleaned and piled. The foundation of the tower and dwelling was completed and the brick work laid up to the top of the first floor joists. 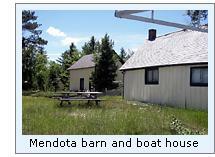 The boathouse was almost completed and the fence posts were all set. During October the oil house and the outhouse was completed. The dwelling and all outbuildings and sidewalks were completed in November. On November 30, 1895, a white Fourth Order Fresnel lens, varied by a flash every 45 seconds, was installed. 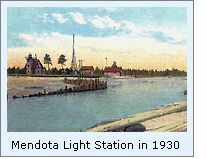 Click here to see a complete listing of all Mendota Light keepers compiled by Phyllis L. Tag of Great Lakes Lighthouse Research. 10 Lights - The Lighthouses of Keweenaw Peninsula. Keweenaw Historical Society.